Snapchat has since its launch turned into a $10 billion company with over 100 million active users, who use the platform every single day. By comparison, Twitter has 320 million monthly active users. As you’ve probably learnt with other social media platforms, brands want to target their audience based on where their attention are. So how are big brands using Snapchat? In this article, we’ll break it down to you, and exmplain how brands can use Snapchat for marketing. Snapchat launched its features Discover and Stories a while back, and this is something that major brands are taking huge advantage of. Large corporates like General Electric, Acura, Coca-Cola, CNN and National Geographic are using Discover, by paying for a marketing slot in the discover page. The reason to this is that it helps these brands gain brand awareness and a ton of exposure. But, of course, if you want to have your ads there, it’s going to cost you. To be placed at the discover page on Snapchat, you will have to pay $50,000 PER DAY! 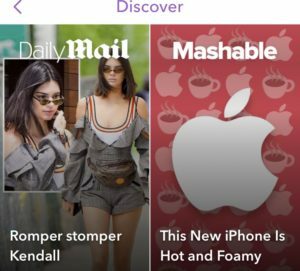 Here, we can see Mashable and Dailymail taking a shot at being on the Discover page. Snapchat is a perfect app that very quickly opens up for more personal interactions, which helps build genuine relationships. Brands can, with the help of Snapchat have a consistent interaction and dialogue with their customers, and also potential customers – that may have any questions about the company. Major companies are also engaging its followers by asking for the followers´opinions, or invites celebrities to take over their Snapchat account for a limited time. For example: McDonald’s invited various athletes to interact and have conversations with their followers on their Snapchat. It is very clear that more companies have realized the importance of personal conversation and connection, as more and more brands are implementing it in their PR and marketing strategies. More and more big brands are using this method to create a bigger hype and buzz around their release. Getting your followers hyped and excited about the release can help you spread the word and get more exposure. Posting exclusive videos on Snapchat also attracts many new followers because everyone wants to be first of seeing your new launch. The key to creating a successful Snapchat buzz around big companies is to create a demand and a “must” of following that page. In short, the page has to share something out of value. In this case, it can be just to share the latest news. One way companies create this hype is to, every now and then give special discounts to the people who are following the company’s Snapchat account. Big companies are also finding this helpful since they can easily track which people have come from Snapchat and which have not, because the discount code is exclusively released to the Snapchat followers. Snapchat can actually help big brands save time and money, even if the platform can be time-consuming itself. Through Snapchat, big brands can now quickly answer to customer queries and questions and expect a pretty rapid answer back. Instead of slow emails, Snapchat offers a new approach to customer service . The brands who are implementing their customer service on Snapchat also tend to get happier customers, since quick replies are everything when it comes to satisfying a customer with good customer service. If you haven’t realized it yet, Snapchat is yet another way for brands to reach their audience. By posting marketing posts on Snapchat, it can help you sell more, because you establish a connection between brand and follower. In addition, you’re also gaining more exposure. The reality is that the more ways for a brand to spread and share its products, the bigger reach the brand will have. Simple as that. Okay, so what’s the conclusion? 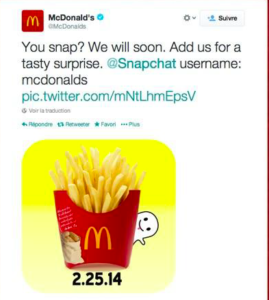 How are big brands using Snapchat? Big brands are using Snapchat in many different ways but what is important to remember is that Snapchat can be a very important tool for marketing and a way of connecting with their customers. Some of the brands that already have hopped on the Snapchat train such as General Electric, Gatorade and The New York Times have found great success on there, and if you ask them, they’ll say that they don’t regret the Snapchat decision a single bit, and that it has been extremely valuable for them. Thank you for reading the article “How are big brands using Snapchat?”. If you have any further questions, whether it is about this article or anything else, we are happy to respond. NextIs Instagram Really Worth My Time?